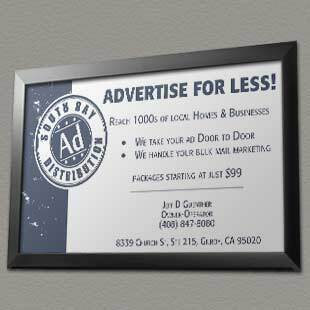 South Bay Ad Distribution exists to serve local businesses & professionals through door-to-door ad distribution & direct mail marketing assistance. In essence, we are here to help you advertise your business & bring you new customers, through our various ad distribution services. This advertising service primarily targets local homes and can include flyers, event promotions, coupons, door hangers, business cards, etc. Put simply, we take your ad and get it on the doorsteps (and in the hands) of thousands of local people in a matter of days. In addition, we can also assist in the ad design and printing. We pride ourselves on making sure that your ad (and its distribution) is always in compliance with local ordinances. This is a highly cost-effective method of increasing your business exposure in a short time period. This advertising service primarily targets other local businesses and includes comprehensive direct mail marketing assistance (printing, folding, envelope stuffing, postage marking, addressing, envelope sealing, USPS delivery, etc.). In addition to the labor of processing a direct mail campaign, we also utilize our most up-to-date business address lists for maximum ad effectiveness. Our competitive advantage includes some of the lowest fees in the industry, an authorized bulk mailing permit (for postage rates at up to 40% less than standard postage), over 7 years of experience with direct mail marketing and an expertise in maximizing your potential successfulness. Above all else, our goal is to always operate with the utmost professionalism, integrity & excellence.